Rosewood Winery’s medium bodied Cabernet Sauvignon is named after legendary 2-Time Reserve World Champion Coosa. The deep rich aroma and flavor of this wine is an outstanding complement to the kind gentle spirit of this beautiful sorrel horse who sired a linage of 16 Reserve World Champions. Coosa’s spirit lives on in his descendants, and is enjoyed daily by the riders in the Rosewood Ranch Therapeutic Riding Program. Our Merlot is smooth, just like our award-winning American Quarter Horse Ermosa Gallo, for which our Merlot is named. Ermosa Gallo has performed at the World Show 5 straight years, finishing in 6th place in 2010. 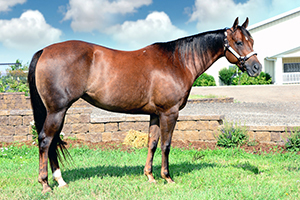 He consistently has produced outstanding foals that are in high demand across the American Quarter Horse industry. "Boots Made for Walking - Blackberry Cabernet"
Boots Made for Walking is the fanciful name for our award-winning Blackberry Cabernet wine. Boots Made for Walking is also the name of our Gorgeous Golden Palomino Mare, a high point earner in Heading/Healing and western horse riding events. She is a playful, sassy mare with sweet personality who has earned her nickname "Nancy"! Just like the horse, our Blackberry Cabernet is sweet and a high point earner, ranking as Rosewood Winery’s consistent top seller. When looking for something else in a horse a few years ago, we came across Merada Time, for which our Chardonnay is named. He seemed too good to pass up, and that is why he is part of our Ranch. Marada Time is a Red Roan Stallion with a pretty face and outstanding confirmation. His first 4 foals were born in March 2013 at the same time Merada began his show career. It’s the beginning of something great! We already know Merada Time is a golden find for us. We believe you’ll discover a remarkable find in our golden Chardonnay. Like our fresh, fragrant and lively Pinot Grigio that carries his name, Invite the Fox has a playful nature and leaves a big impression. Fox, as he is commonly called, is a Big Bay Gelding that stands 16 hands tall. He’s all quarter horse, but has the look of a thoroughbred. Fox is the consummate team player. Ridden by our independent riders, he competes at horse shows and does exceptionally well. He is the half-brother of two other horses at Rosewood Ranch: Flashy and Starlet. High Expectations are in order for Heza Good Gangsta – both for our wine and our horse. A Red Roan Gelding, “Gangsta” – as we like to call him – is a very handsome and gentle horse with a bright future as a competitor in the equestrians with disability (EWD) class in horse shows. The name “Gangsta” fits him because he works so well with others. The same can be said for our Sauvignon Blanc. As a full-bodied dry white wine with a crisp and clean finish, it can stand alone, or it blends perfectly in a pitcher of Gus’s Trail Dust Wine Cooler Mix. Daisy Duke is a spunky little Mare who is quite popular with children therapeutic riders at Rosewood Ranch. She stands just 13 hands, which equals 4.5 feet tall. This Bay Overo Welch cross pony is beautifully painted brown and white. She is well trained in Dressage and Jumping. Though spirited, she is very gentle with our therapeutic riders. As for our Green Apple Riesling, it mirrors the horse for which it is named in many ways. The wine provides initial tartness to the palate, which gives way to the refreshing taste of crispy and juicy green apples. Jordans LenaSpark is the fanciful name of our Mezza Luna Blanc; it’s also the name of our pretty Chestnut Mare at Rosewood Ranch. Both seem to do it all! Our semi-sweet wine is full and round with big fruit flavors – a perfect blend between sweet and dry that is sure to please a wide range of wine-tasting palates. Our Mare is also up to the task. As a worker, she’s very effective at driving cattle. As a Prize Show Horse, Jordan finished in the top 10 at the World Show twice as a junior horse (5 years & under) in Heading/Heeling. She enters a new chapter in her life as a broodmare. More great accomplishments are in her future! Combining a delicious blend of fruit flavors, our Peach Apricot Chardonnay is described as sweet with light body. The same words can describe the horse that represents the fanciful name of our wine. Drawn by the horse’s incredible beauty as a 2-year-old, we were able to purchase “Dolly,” as we call her, on New Year’s Eve more than a decade ago. Just like the wine that bears her name, “Sheza Lady Principle” exceeds expectations. She has carried several riders to blue ribbon finishes over the years. With her sweet and nurturing personality she is the perfect choice for our riding program. With its hints of refreshing peach and apricot, our Chardonnay is also a perfect choice among our sweet sparkling wines.